With the ResourceManager Restart enabled, the RM being promoted to an active state loads the RM internal state and continues to operate from where the previous active left off as much as possible depending on the RM restart feature. A new attempt is spawned for each managed application previously submitted to the RM. Applications can checkpoint periodically to avoid losing any work. The state-store must be visible from the both of Active/Standby RMs. Currently, there are two RMStateStore implementations for persistence - FileSystemRMStateStore and ZKRMStateStore. 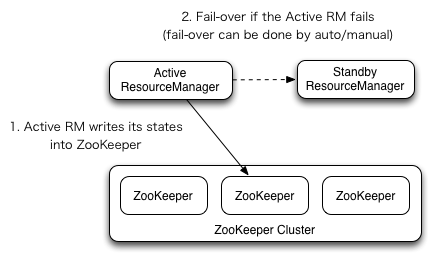 The ZKRMStateStore implicitly allows write access to a single RM at any point in time, and hence is the recommended store to use in an HA cluster. When using the ZKRMStateStore, there is no need for a separate fencing mechanism to address a potential split-brain situation where multiple RMs can potentially assume the Active role. When using the ZKRMStateStore, it is advisable to NOT set the “zookeeper.DigestAuthenticationProvider.superDigest” property on the Zookeeper cluster to ensure that the zookeeper admin does not have access to YARN application/user credential information. Most of the failover functionality is tunable using various configuration properties. Following is a list of required/important ones. yarn-default.xml carries a full-list of knobs. See yarn-default.xml for more information including default values. See the document for ResourceManager Restart also for instructions on setting up the state-store. hadoop.zk.address Address of the ZK-quorum. Used both for the state-store and embedded leader-election.